The Yes Tracy 2 is based on the classic shape of the Ping Anser. It's one of Yes Putter's top of the range putters and has a high-end appearance. The materials it's made of look good and the contrast of brushed top edge and darker back works well. It's not as hard an appearance as many other Yes putters which can look a bit like bricks. No, this is different from most of the Yes range - it looks sleek and well finished. The slight difference between this and the original Anser shape is the wider leading edge which is needed to accommodate the depth of the patented C-Groove in the face of the putter. Looks good, right? The only thing you might not like about the Tracy is way the hosel covers the heel end of the leading edge. 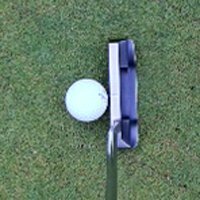 A question of taste, of course, but many people feel that not seeing the all of the top of the leading edge from heel to toe makes it harder to aim a putter. In our view, the feel of the Tracy 2 doesn't match its looks. For some reason the strike off the face is hard and a little bit clunky. All those soft lines and polished looks somehow don't translate to the kind of feel you get from a Scotty Cameron, Odyssey or Ping Redwood. In addition to this we found the toe end weighting to be a little strange compared with most Anser shapes. The Tracy 2 is fairly heavily weighted on the toe (it hangs at about 8.30 rather than 7.30) and in the short time we trialled the putter it seemed to be hard to square the face reliably. Again, probably just a question of getting used to it, but there you are. This is without doubt the the Yes Tracy 2's major strength. The C-Groove's roll is the stuff of legend and really does seem to make a difference - your putts roll on and on and hold their line beautifully. Harold Swash's design is a masterpiece. Probably the most attractive and refined putter in the Yes range. The Yes Tracy 2 has looks to match a Scotty Cameron, an Odyssey or any top name brand. Unfortunately the strike off the Tracy 2's putter face nevertheless feels a little hard and pingey, and might take some getting used to. The roll, though, is awesome. All in all a very attractive putter. Looks, however, are its greatest strength.